KitchenAid Artisan Mixer Review - 5 Features That Make It A Great Choice! 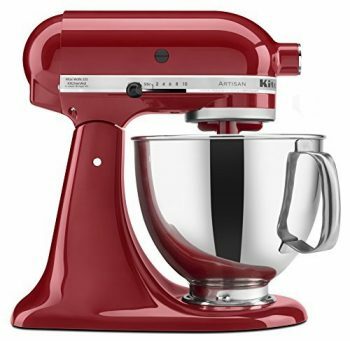 If you search for a KitchenAid Artisan Mixer Review, what stands out is how reliable they are. We’ll look into that, and we’ll also talk about how much fun you can have with a KitchenAid Artisan Mixer. Read all – just scroll down. Or click on the menu, for what interests you! What Is The Mixer Really Like? Is This the Mixer for Me? The Artisans are all built on the same foundation of solid construction. It has a powerful motor and many attachments. It can be the one small appliance in your kitchen that does a lot of the heavy lifting. What I love is how easy it is to clean. Food doesn’t stick to the surface, and it looks like new with a quick wipe with a soft cloth. KitchenAid designed it to be a smaller version of a commercial mixer. The stainless steel bowl has a 5-quart capacity. That’s 4.5 bread loaves, or 9 dozen cookies if you’re going all out. And it’s not all baking. With that, it can yield 7 pounds of whipped potatoes as well, which can be a lifesaver if you’re hosting the holidays, with a lot of family and friends. What’s more – it can go in the top or bottom rack of a dishwasher. However, most people often start with the 5-Quart Artisan Mixer because of its features. It is the most versatile, for many folks, and allows you to do large and small batches easily. It is also a popular choice because of the extensive range of colors. You might think it’s expensive. When you find out all that it does and how it saves you money, you’ll be in the kitchen cooking more often, thinking how much value for money it delivers! Beware! The beater is based on a 59-point planetary mixing action. The head holding the paddles rotates in one direction, the paddles themselves rotate in the opposite direction, very efficient! Adds up to you not having to rotate the bowl like a hand mixer. Plus the Artisan Mixer also reduces the amount of time you have to scrape down the bowl. You can even buy a paddle attachment with a spatula-like edge on it that scrapes the bowl for you. The stand mixer is designed to blend things more evenly, as well as faster. This helps with not over-mixing delicate things like quick breads and muffins! I used to have many a batch of hand made scones turn out just a little rock like! Artisan saves the day – or the scones!!! When you do have to scrape down the bowl, you no longer have to find a safe place to put your hand mixer. Didn’t you just hate when something would fall off of the beaters onto your floor or your stove? I constantly had a cloth handy, when using a hand mixer! Well, no longer. Now you just unlock the head and rotate it up and out of the way on a solid hinge for easy access. It’s also very easy to swap out attachments on the multipurpose attachment hub, with its hinged hub cover. One simple twist removes the old attachment and one quick twist secures the new one. The hub cover also keeps the attachment slot clean. So going back to our mashed potatoes for a moment. Let’s pretend you used the paddle, to mash the potatoes and blend in the butter and milk. Then you lift up the mixer head to replace the paddle with the wire whisk. Then you can run the mixer quickly on high to create those perfect light and fluffy whipped potatoes. The ones we see in high-class restaurants and cooking shows! The bowl that comes with the Artisan Stand Mixer is stainless steel. You can also purchase additional bowls in stainless steel, or glass depending on your preference. They lock into place firmly, yet are still very easy to unlock and remove. Remember how annoying it is when you’re trying to cream butter and sugar and the bowl spins instead of the beaters on your hand mixer? The KitchenAid Artisan Mixer has ten speeds for better speed management, and no flour clouds!!! When making a chocolate mousse, you want a very slow speed for gentle blending that isn’t going to ruin the lightness of the dessert. Its top speed is very fast so you can whip up cream, or egg whites in a fraction of the time it takes with a hand mixer. Have you ever thought of something as both a pro and a con? The weight of the KitchenAid Artisan Mixer is like that. This unit weighs over 25 lbs. That’s great because it’s not going to be moving around your counter when you’re using it, even when kneading bread. The downside is that it’s not so easy to pick up and put away if you have smaller counters. However, if you can leave it out, you are certain to find yourself using it for more things, maybe adding additional attachments, your life would surely be much tastier! Your investment in this power horse will reward you for a very long time. Most people use their KitchenAid Mixers for decades! How many bread machines and hand mixers last that long? And wouldn’t it be great never have to use a box grater again? Your knuckles will thank you. Once you start cooking with the basic KitchenAid Artisan Mixer, you’ll start asking for attachments for presents, so you can expand your cooking. You’ll get rolls kneaded, which can rise while you’re spiralizing zucchini for a zoodle casserole. You can make tomato sauce using fresh tomatoes and the vegetable strainer attachment. And finally, you can shred some cheese to go over the top. You’ll save money by buying fresh ingredients that you use up right away. So why not run out and buy a less expensive Hamilton Beach, or another brand of stand mixer. The bottom line is the construction. Many inexpensive stand mixers are just larger hand mixers with two beaters. KitchenAid is built to last and comes with additional attachments to expand the Mixer into a small kitchen appliance Swiss-army knife. Sometimes you’ll see the mixers advertised on Amazon with the pouring shield mentioned in the title, and others don’t. The mixer is supposed to come standard with the pouring shield, that has a wide spout for easily adding in while the mixer is running. There is a one-year “hassle free” warranty from the date of purchase. They want you to be satisfied with their mixer, and they want to ensure everything works correctly. It’s also worth noting that KitchenAid has world class customer service. You can call them Monday through Friday from 8am – 8pm Eastern and Saturday 10am – 5pm Eastern. It has also been my personal experience that they go above and beyond what they offer in their warranty. I purchased a used pasta roller set and one of the attachments was missing. I called to see how much buying just that one piece would be, and they sent me a replacement for free. So if you have any questions or concerns, they are only a phone call away to help you. Over 20 colors are available. Some colors have been discontinued or were created for special occasions. Pink is usually available in the month of October. The Purple KitchenAid Mixer is a highly desired color that enhances every kitchen, but it’s not easy to find. And the KitchenAid Mixer Teal is another treasure. Trim is chrome except where noted. Phew – a marathon – just listing them all! As mentioned, KitchenAid also launches special colors for particular occasions, as well as new colors added to the line – you never know what color will be just perfect for your kitchen! 1. Tilt-head Flex Edge Beater. It’s like the paddle attachment but has a scraper built in. 2. Sausage Stuffer Kit works with the food grinder. Put to shame the idea that you don’t want to know what’s in sausage and make your own breakfast or Italian sausage. 3. Food Grinder – Grind meat, cheese, and bread from coarse to fine. Coarsely grind blends of meat to make your own gourmet burgers and finely grind the bread crumbs to make meatloaf with the rest. 4. Fruit & Vegetable Strainer – Strain and puree fruits and veggies quickly and easily. Make applesauce without having to peel anything. Baby food from organic fruits and veggies at a fraction of the cost, use with the food grinder or found in a set. 5. Food Tray – Work with larger batches of ingredients with the food grinder, fruit and vegetable strainer or sausage stuffer attachment. 6. Citrus Juicer – From orange juice in the morning to fresh lemon juice to add to your homemade hummus or a fresh salad dressing. 7. Ice Cream Maker – Imagine buying fresh strawberries in season and crafting your own strawberry ice cream. 8. Grain Mill – Choose your consistency from cracked to extra-fine. Then use the dough hook to knead your dough. 9. Ravioli Maker – Works on its own if you prefer to hand roll your pasta dough. But once you try the Pasta Roller attachment, you may change your mind. Raviolis are great for using up leftovers or hiding vegetables like butternut squash. 10. Pasta Roller – smoothly work the dough and then increase the pressure to make lovely dough sheets. You can then change out the attachment and create spaghetti and fettuccine. 11. Gourmet Pasta Press – don’t limit yourself to the flat stuff. This attachment also makes spaghetti, bucatini, rigatoni, fusilli, and macaroni. 12. Rotor Slicer/Shredder – Buy cheese blocks for cheaper and grate your own. Or do you have potatoes and zucchini laying around? Shred them up and make potato and zucchini cakes for breakfast or dinner. 13. Food Processor – Yes – you can even use your KitchenAid Artisan to replace yet another large appliance in your kitchen. Obviously fantastic! Think of all the space when you don’t need any of these other appliances, and items filling your cupboards! Investing in a solid small kitchen appliance is a great idea if you want to start cooking more to save money. You will eventually invest in additional accessories. Imagine how proud you’ll feel when receiving compliments on your hamburgers that you blended and ground. Do you have kids in school? How many bake sales will you need to produce treats for? And how often do you find out the morning that they’re due? The Artisan Mixer will help you create cookies at the last minute in a hurry. It will cream the butter that’s still cold from the fridge and the sugar in far less time than if you had to soften the butter and use the hand mixer to get the process started. You will especially want the stand mixer if you live in a small apartment as it will replace a lot of the other small appliances and gadgets you have around. So you prefer eating organic or ensure that your food is minimally processed and preservative-free? If you are thinking that you’ll have to be stuck in the kitchen and trying to figure out a manual food grinder or a food mill, this appliance is for you. Do you have gluten allergies and want to grind other grains into your own flour mix? And that includes almonds or other nuts. Then you can knead the dough for making your own crackers or rolls. You will save so much money then having to buy these items from your specialty grocery store. If you don’t cook from scratch, you won’t need a mixer like this. And don’t feel guilty. Maybe some day you’ll get bitten by the cooking bug. If you live with others and have shared cooking space that you have to keep clean, you may want to hold off on buying one. It’s pretty heavy to be shuttling back and forth. Of course, you may be able to leave it out if you let others share it. Hopefully, this KitchenAid Artisan Mixer Review has been useful for you and convinced you that it is not only a smart investment but that it will also make cooking fun again. The many accessories will push you to new levels of cooking. The mixer comes standard with three mixing attachments that will get you cooking right out of the box, no additional accessories necessary. You may need to have a yard sale to get rid of all the other small gadgets and appliances you’ve bought over the years. That will allow you to buy more attachments. There are many bright and cheery colors to choose from that would enhance any kitchen. So don’t walk! – RUN! – Get your KitchenAid Artisan from Amazon NOW!!! Which color do you think would fit best in your kitchen?